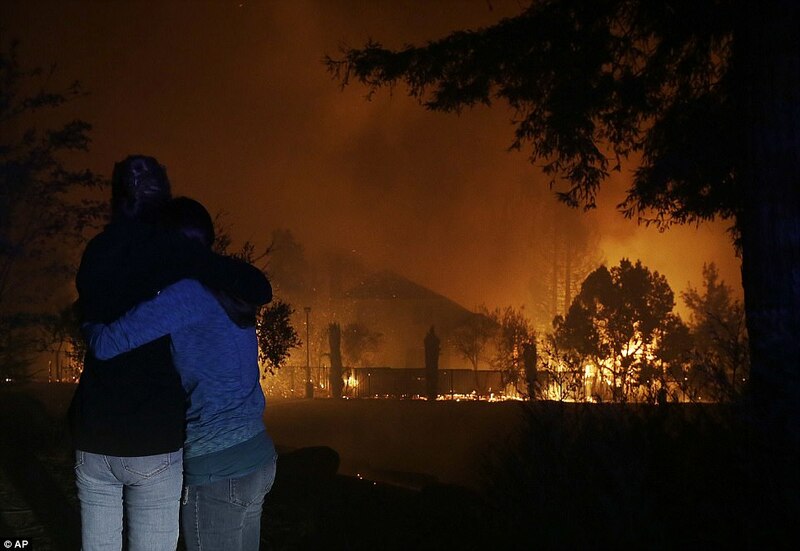 Wildfires whipped by powerful winds swept through California wine country Monday killing at least 10 people, destroying 1,500 homes and businesses and sending thousands fleeing. 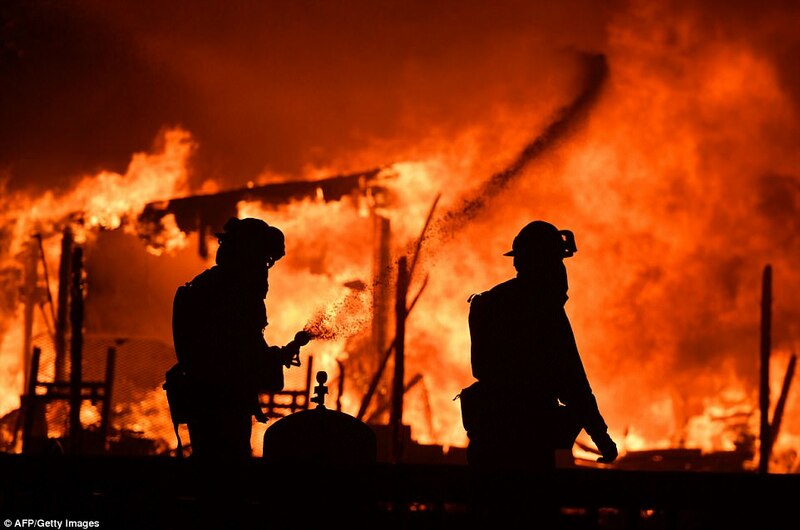 Fires raged unchecked down tree-lined streets and through upmarket neighborhoods, reducing a Hilton hotel to ash and turning the sky above Disneyland bright orange. 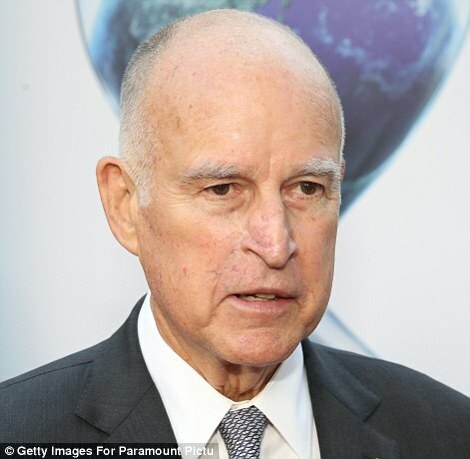 Governor Jerry Brown declared a state of emergency as fourteen large fires burned over a 200-mile region north of San Francisco from Napa in the south to Redding in the north, fanned by 50mph winds. 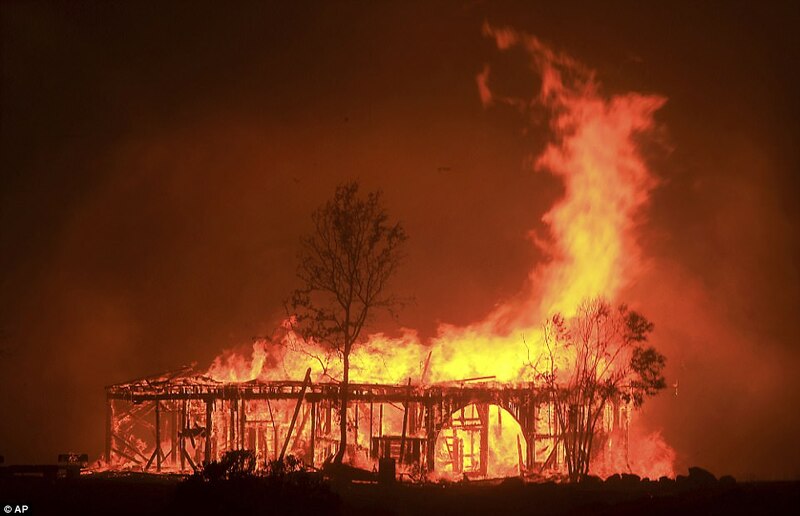 At least 11 people are known to have died including a married couple, aged 100 and 99, who were unable to evacuate in time. A deaf-blind woman is also believed to be among the dead. 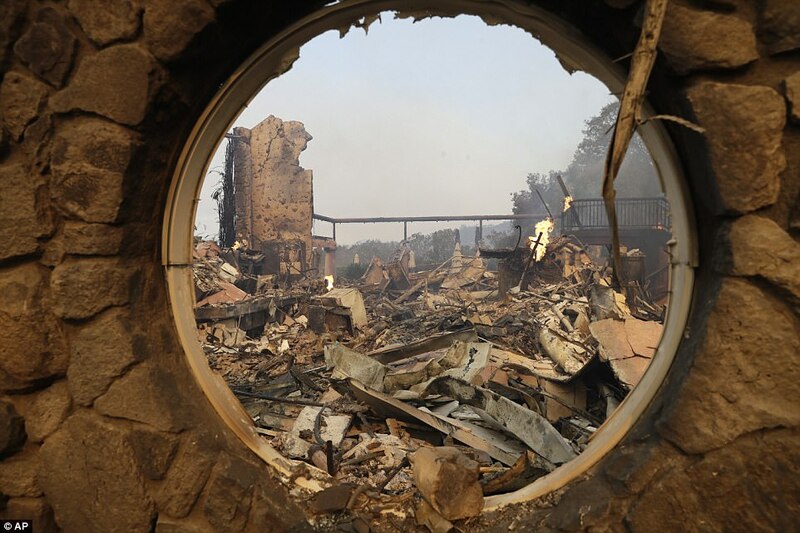 A chimney stands alone in a destroyed home in Santa Rosa on Monday, October 9. 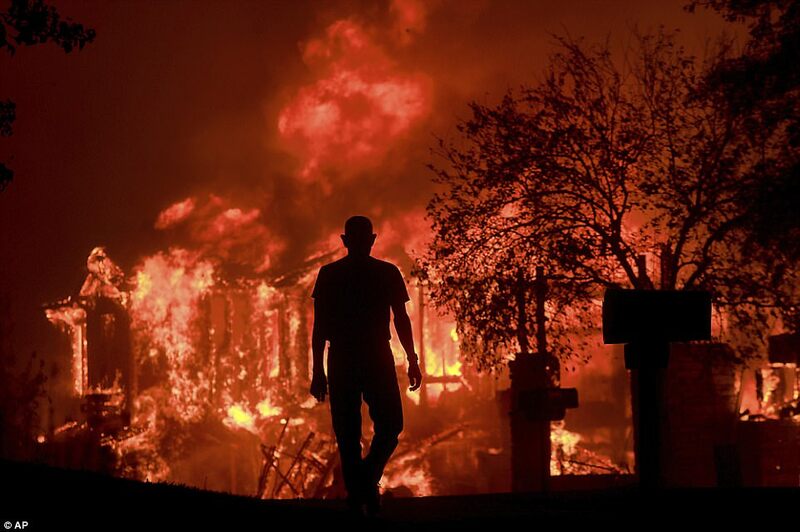 October has generally been the most destructive time of year for California wildfires. Charles and Sara Rippey died in their home north of Napa on Monday, granddaughter Ruby told KTVU. The couple had recently celebrated 75 years of marriage and Charles, known as Peach, turned 100 not long ago. ‘The only thing worse would have been if one survived without the other,’ Ruby told the news station. 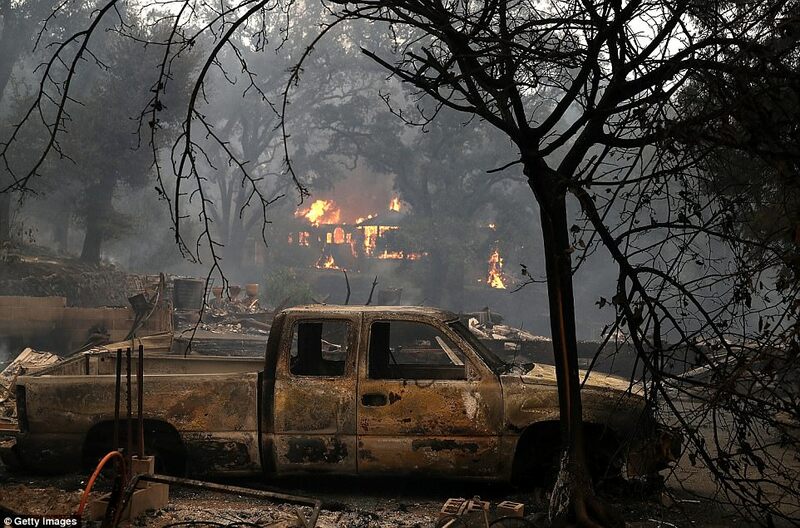 As he fled through the ember-strewn streets of his neighborhood in Santa Rosa, Jeff Okrepkie knew it was probably the last time he would see his home of the past five years standing. His worst fears were confirmed Monday morning, when a friend sent him a photo of what was left: a smoldering heap of burnt metal and debris. 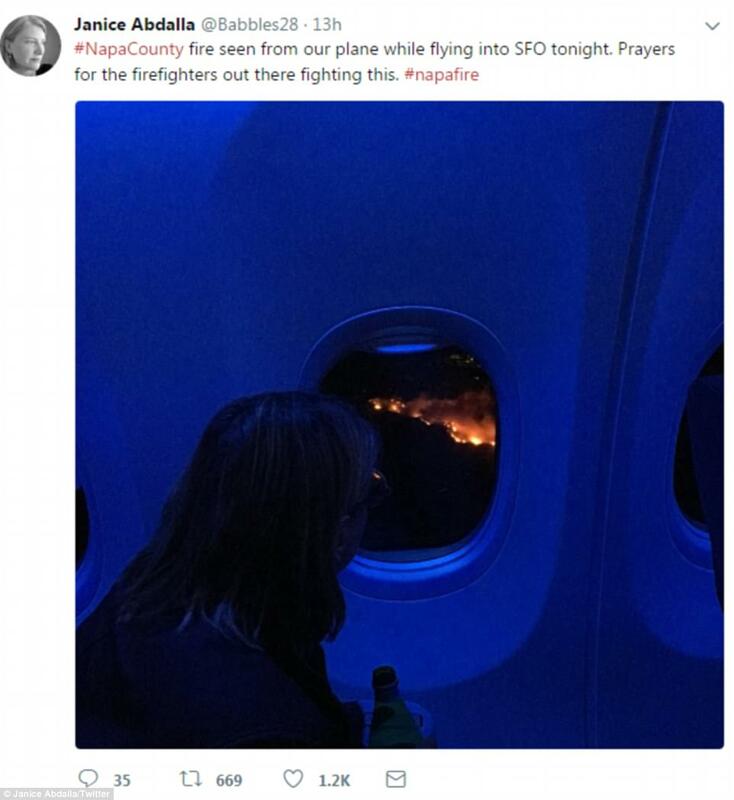 Also forced to evacuate were former San Francisco Giants pitcher Noah Lowry and his family. 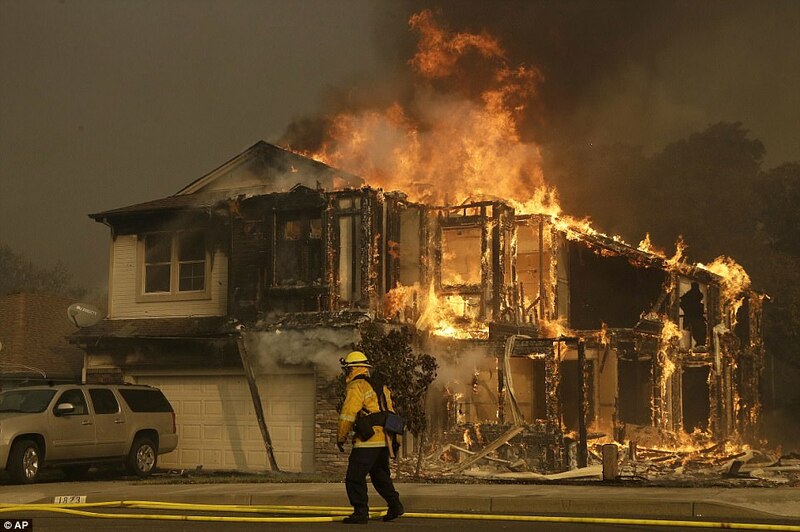 Lowry told The Associated Press that he; his wife Andrea; his two daughters Averlee Rose and Anniston; and his 2-week-old son had to leave their home in Santa Rosa in a matter of minutes as the flames approached. 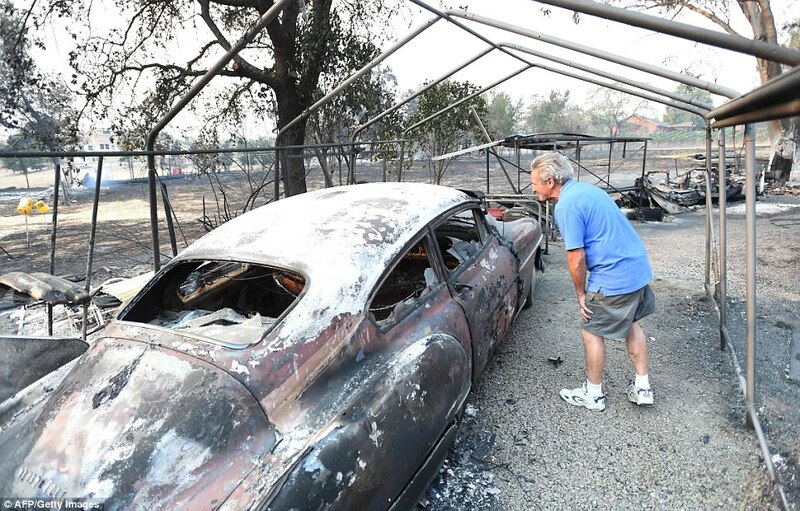 He said he ran into a closed US 101 freeway because the flames had jumped it. But he and his family were able to get away in time and get to a friend’s house where they are staying now. Lowry, who pitched for the Giants from 2003 to 2007, now co-owns Santa Rosa Ski & Sport – an outdoor sporting goods store in Santa Rosa. 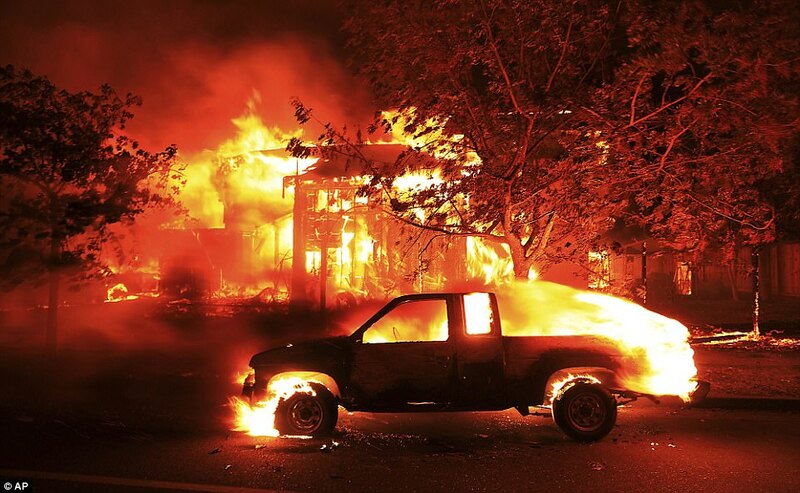 The ferocity of the flames forced authorities to focus primarily on getting people out safely, even if it meant abandoning structures to the fire. 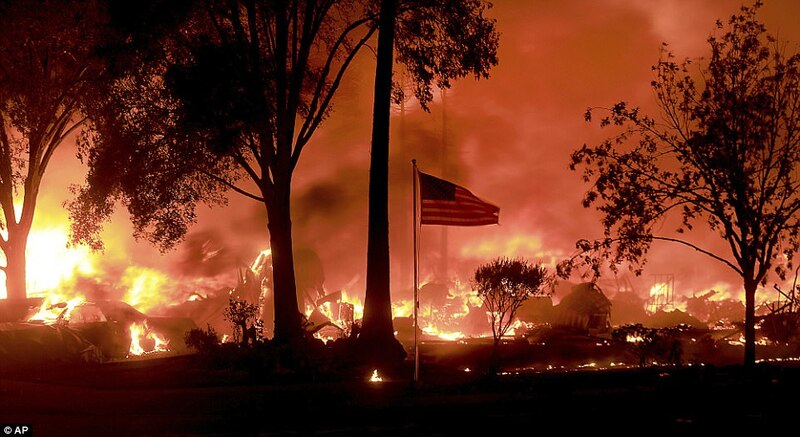 The fire area covered more than 100 square miles (160 square kilometers) over eight counties. 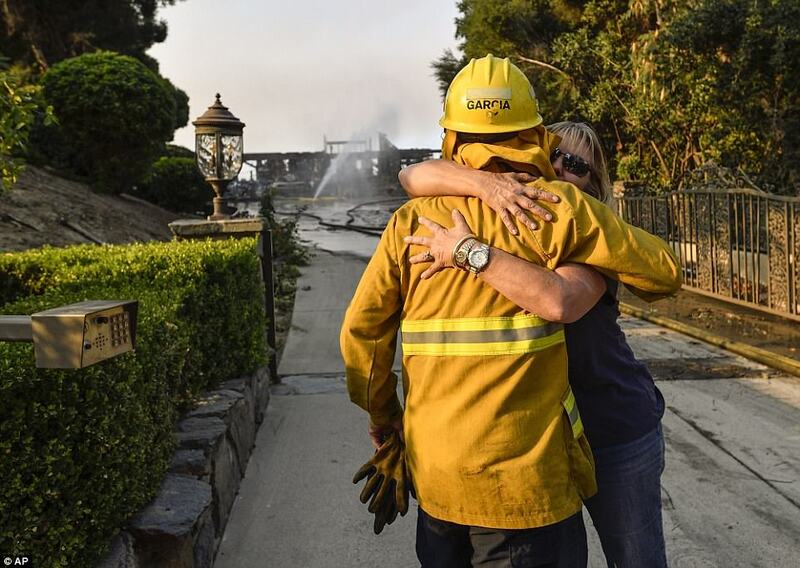 Elsewhere in the state, a fire churning through canyons in hilly neighborhoods of Orange County burned multiple homes and forced residents of about 1,000 homes to evacuate. 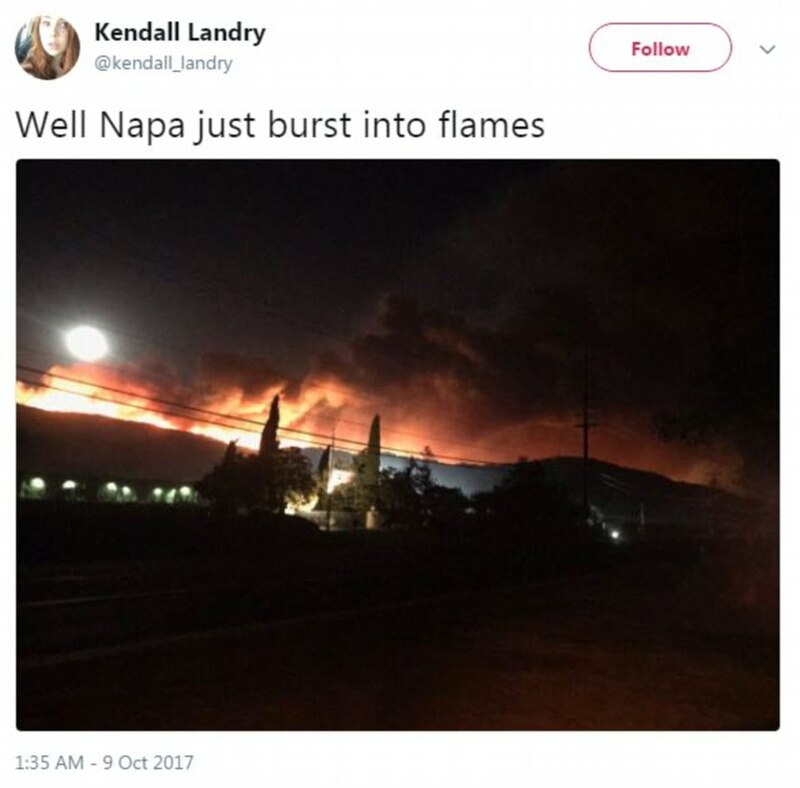 Some of the largest blazes were in Napa and Sonoma counties, home to dozens of wineries that attract tourists from around the world. 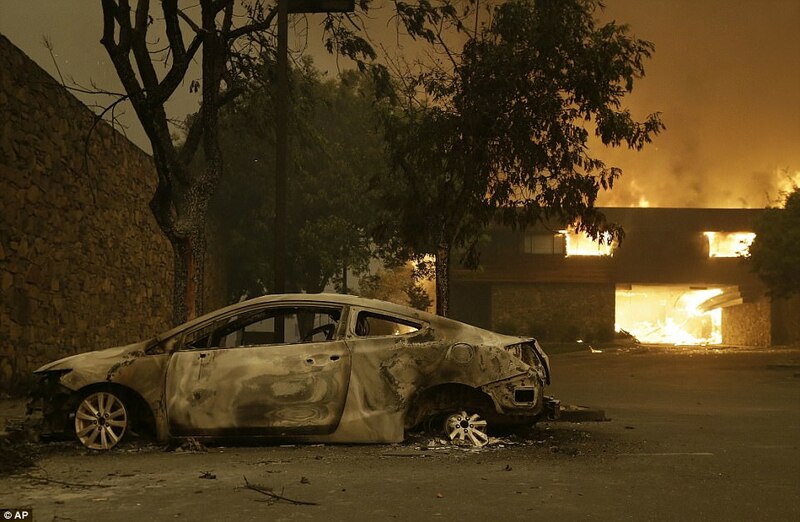 They sent smoke as far south as San Francisco, about 60 miles (96 kilometers) away. What caused the blazes was not known. 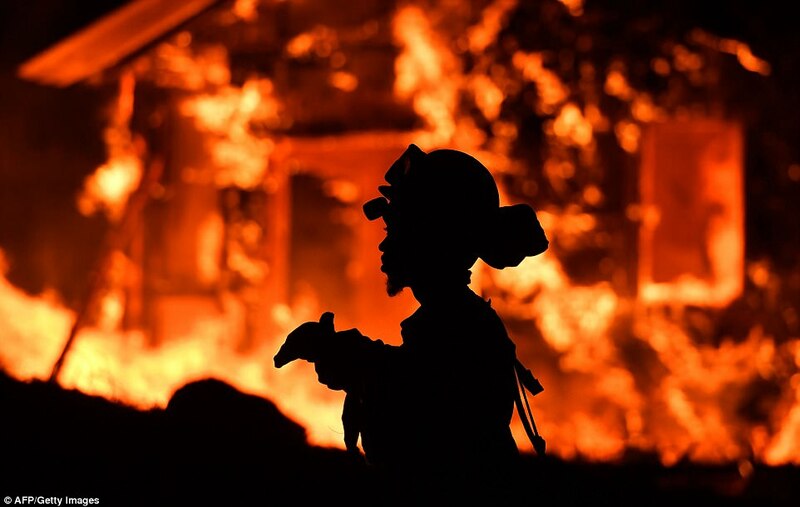 More than 300 firefighters have been working to control the raging wildfire, which have destroyed 57,000 acres total leaving 50,000 people without power. 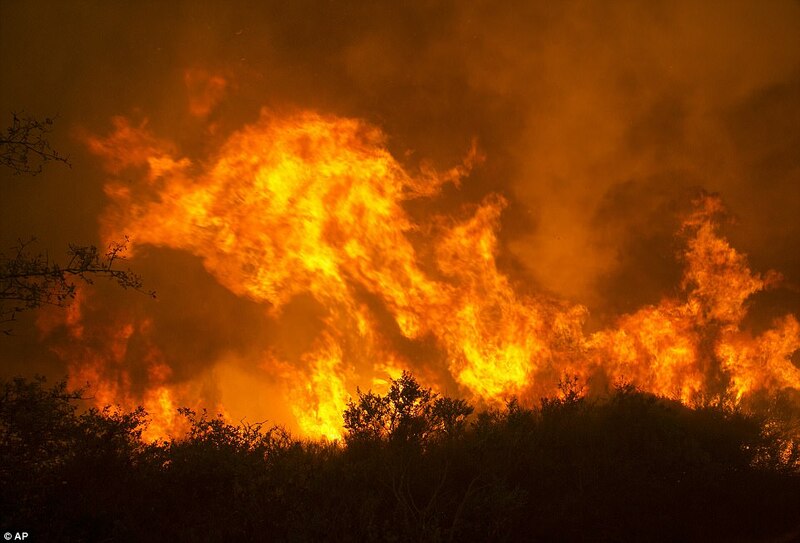 Because of strong winds and hot, dry weather, it appears the flames will continue for some time. 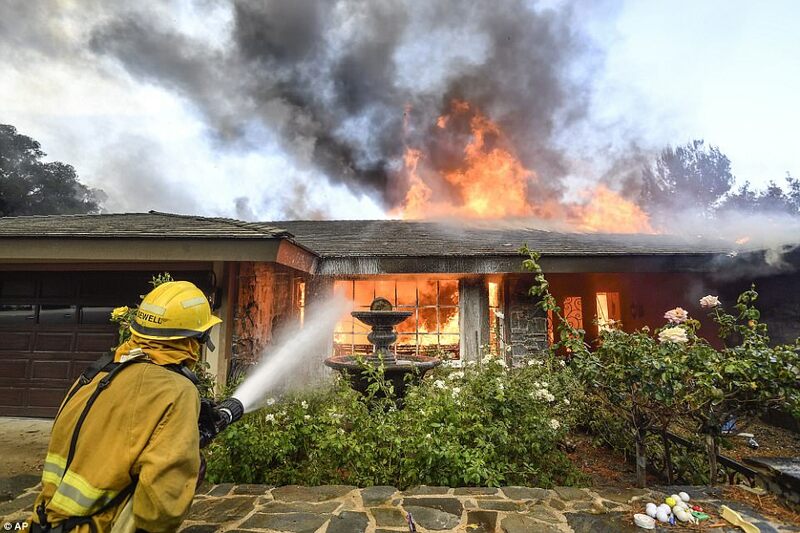 Ken Pimlott, director of the California Department of Forestry and Fire Protection, said firefighters are concentrated on saving lives rather than battling the blaze. 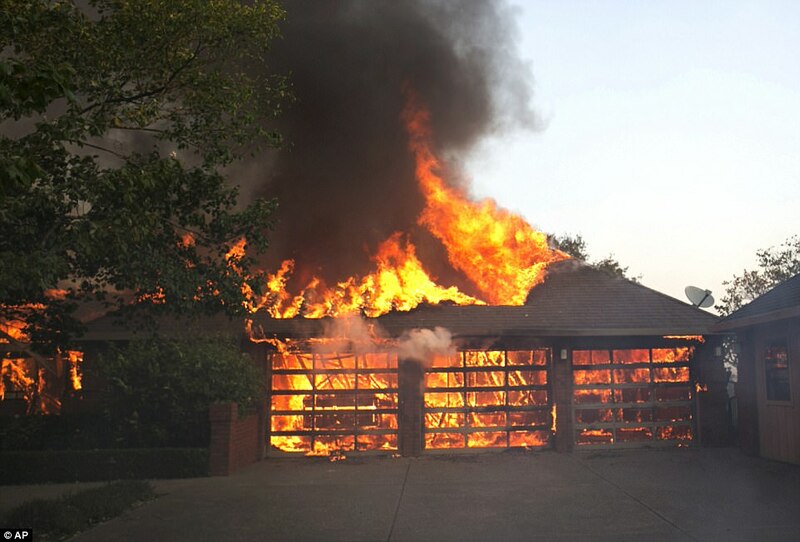 Several people have been treated for burns and there is at least one fatality at this time. 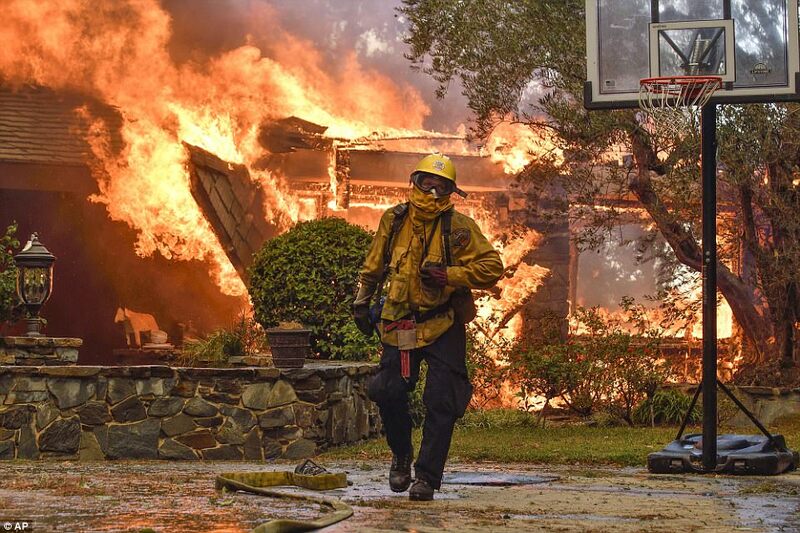 Deputies were dispatched to help firefighters and California Highway Patrol officers with evacuations, going door to door to rush people to safety. 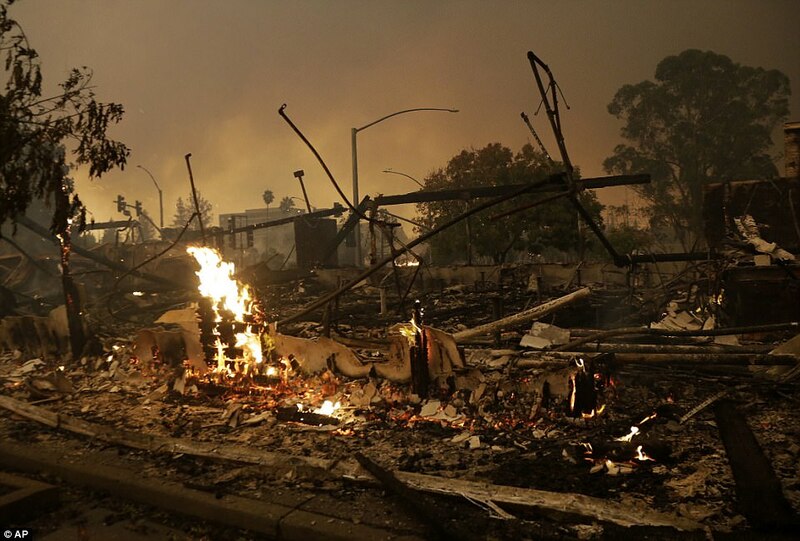 Santa Rosa, the largest city in the fire area with a population of about 175,000, was hit hard. 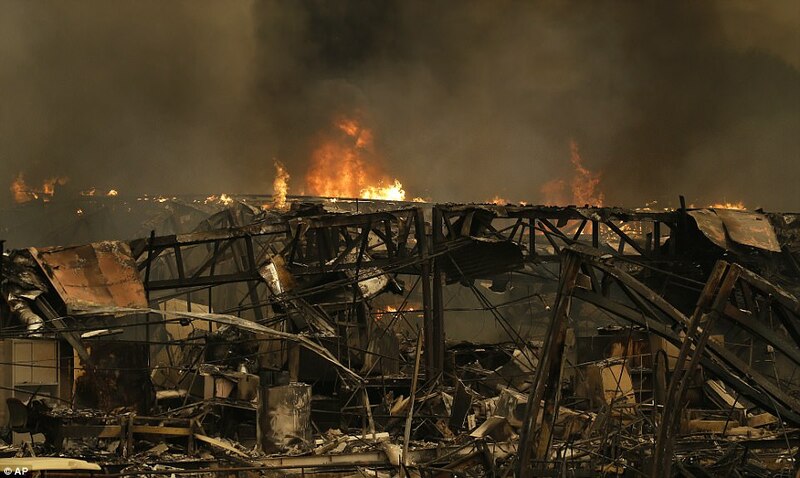 The city lost a Kmart and other businesses and homes as the blaze shut down its schools and put a Hilton Hotel in ruins. 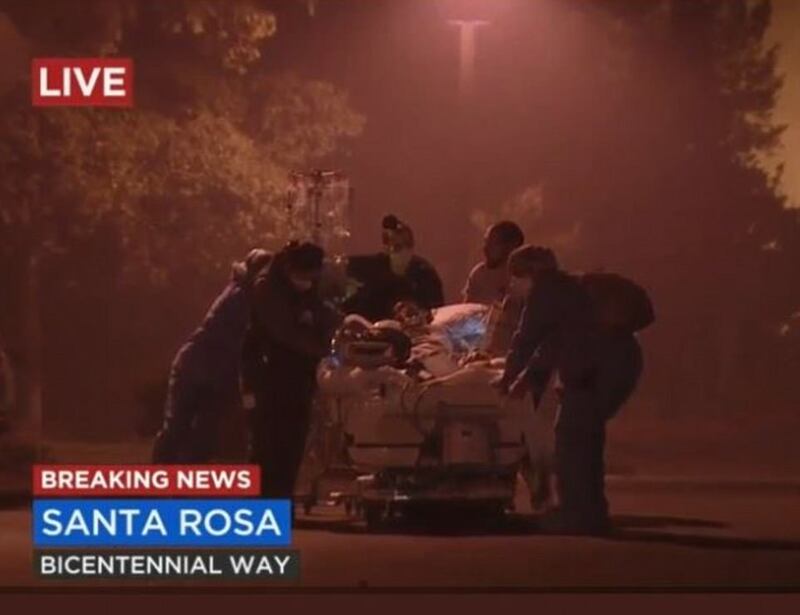 Firefighters worked to evacuate Kaiser Permanente Hospital and Sutter Hospital as well as senior centers in northwestern Santa Rosa over night. 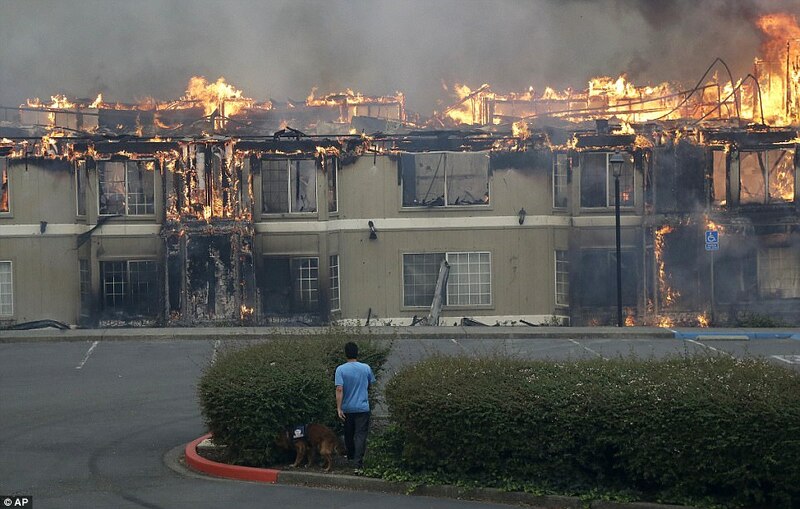 One woman said, ‘I drew my blinds and I just saw flames all up on the hill behind my house’. 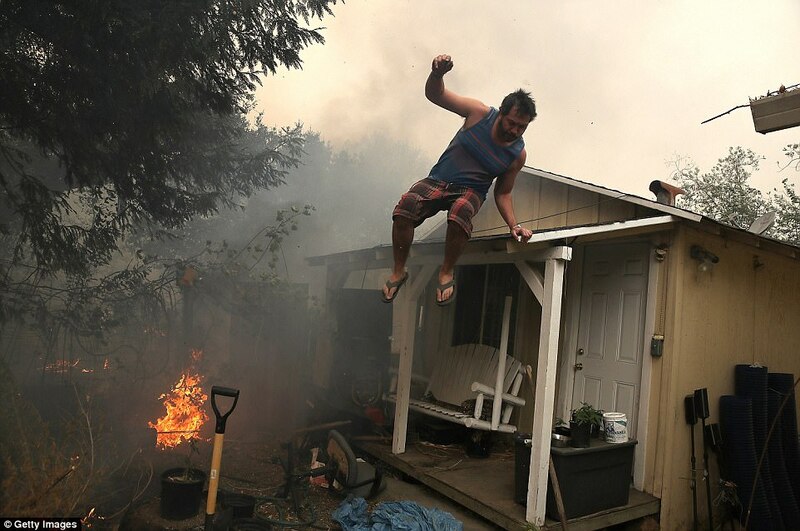 A number of roadways were blocked due to downed trees and fires were burning on both sides of Highways 12 and 101 as gusts reached up to 60 mph. 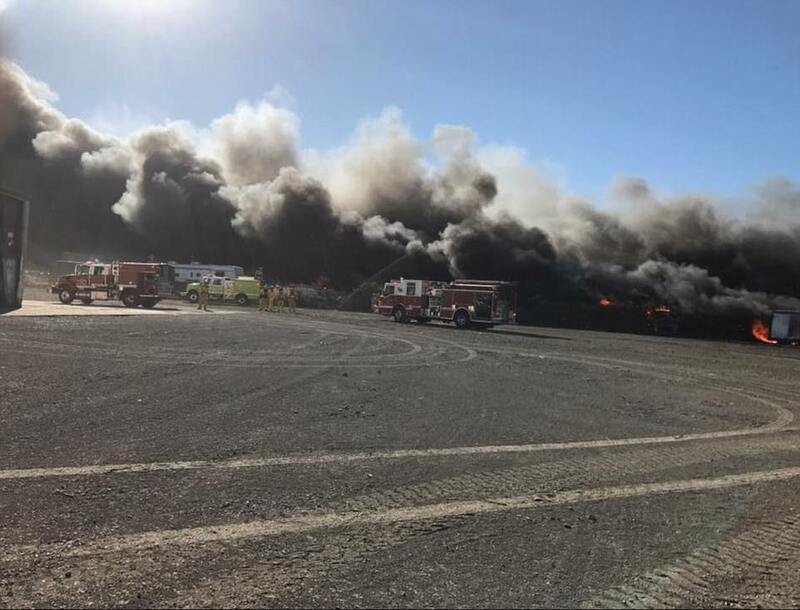 The Napa County Fire Department responded to flames at an auto salvage yard that destroyed two structures and reported 50 to 100 cars burning. 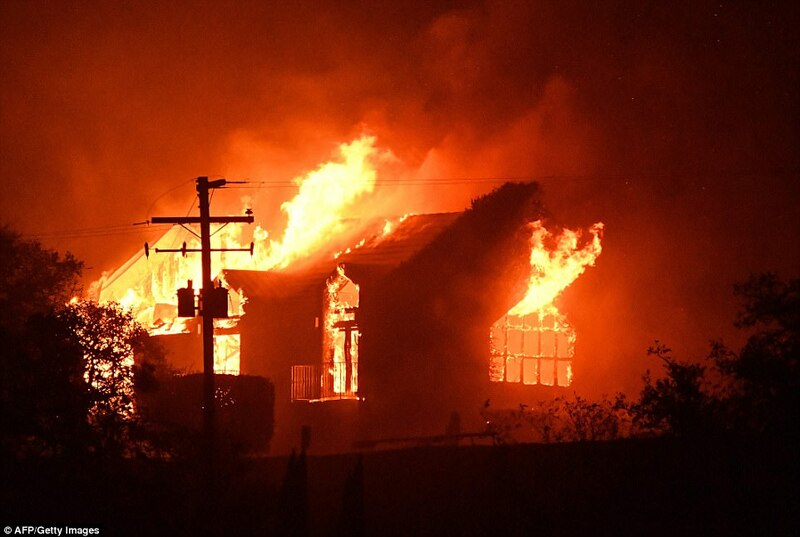 Businesses and structures such as the historic Fountaingrove Inn Hotel are completely burned down. 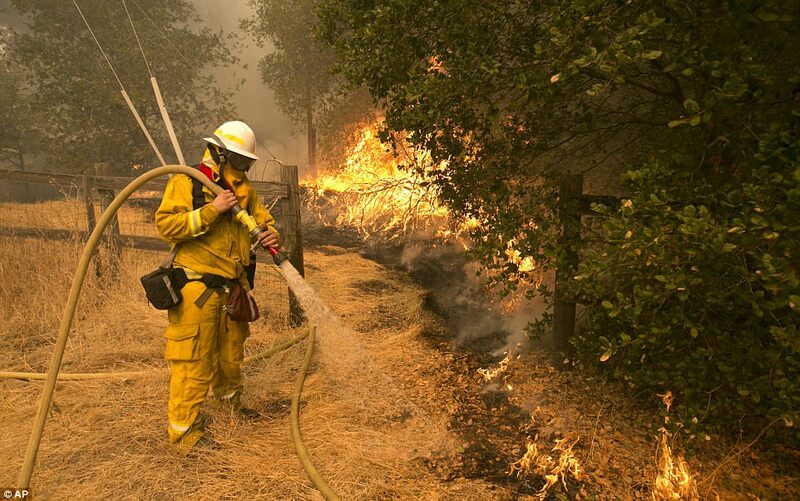 Community centers, the Sonoma County Fairgrounds and other local centers have been opened as shelters to house evacuees. 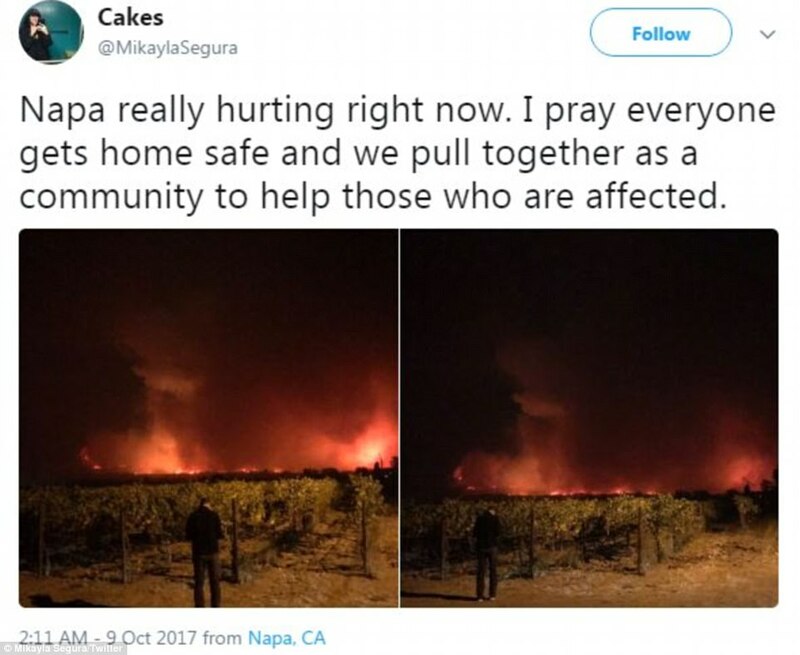 A GoFundMe has been started to raise money for Napa and Sonoma Counties relief. 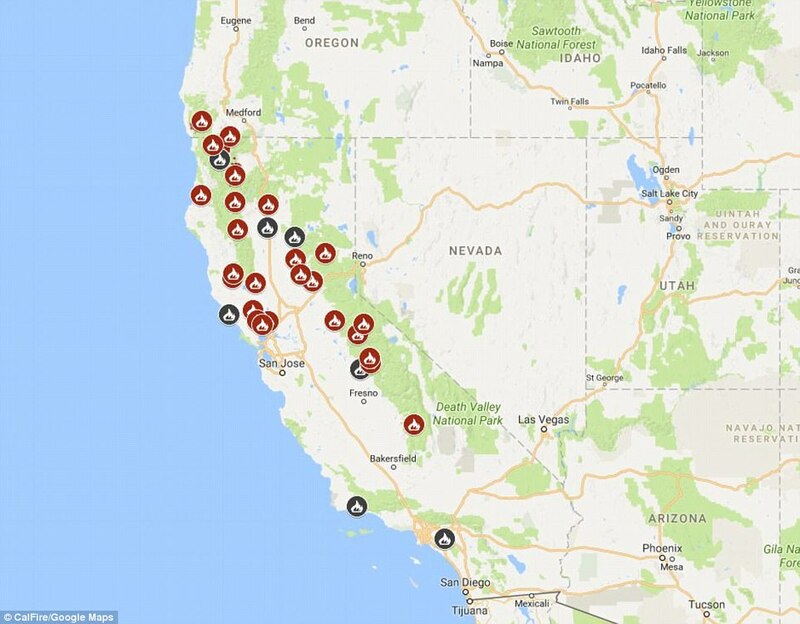 This come after a summer filled with wildfires in California. 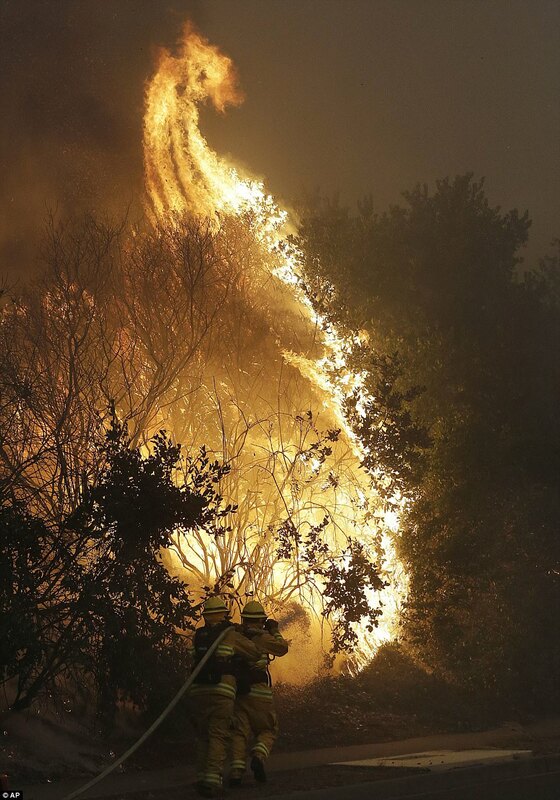 This year a total of 6,744 fires have burned 731,260 acres.